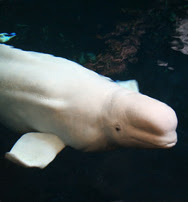 Our favorite exhibit at the aquarium was Cold Water Quest, home of the Beluga whales. First of all, the whales are striking. I think we stared at them for 20 minutes. Mesmerizing music plays in the background, enhancing the experience of watching the whales swimming gracefully through their space. One thing I didn't know about Beluga whales was that they have a flexible neck and ican move their heads in all directions. Sometimes it looked like they were turning their heads to look at us. One whale spent the majority of his time swimming right in front of the viewing glass. He would swim to the top of the pool and grab a mouthful of water. Then he would swim back down and blow (spit out?) a perfect ring of bubbles. Then he would chase the ring of bubbles and catch it in his mouth! He looked like he was having a great time. These whales were rescued from amusement parks in Mexico, so I can only imagine what kinds of tricks this guy knows how to do. What was fun about watching him was that he was doing this for his own enjoyment, not because a trainer was telling him to do it. We know that mammals play for various reasons, like my cat with her balled-up piece of paper - but I've never seen (or comprehended, anyway) a whale playing alone just for fun. He might even have wanted to entertain those of us on the the other side of the glass, considering that it was his "job" for some time. Either way, we enjoyed seeing these giant creatures up close and learning more about them. I have mixed feelings about zoos and aquariums. It's disturbing to me to see animals confined in an artificial environment for the purpose of entertaining humans. On the other hand, many zoos and aquariums these days are all about conservation, education and sustainability and are part of programs like the Species Survival Plan whose mission includes reintroduction of wildlife bred in zoos and aquariums "into restored or secure habitat as appropriate and necessary." And I also believe that the more people can relate to animals, the more motivated they will be to preserve their habitats and support animal welfare issues. Some animals, like the Belugas in this exhibit, may not have been able to survive in the wild after serving time in their amusement parks. So in this case, which is better - living in a cramped pool in an amusement part, doing tricks for crowds, or being allowed to interact with other whales in a simulated natural environment in an aquarium ?